Yunyun mused in front of the potted plant at Megumin’s house. Yes, the very same pot that the Tranquility Girl is planted in. 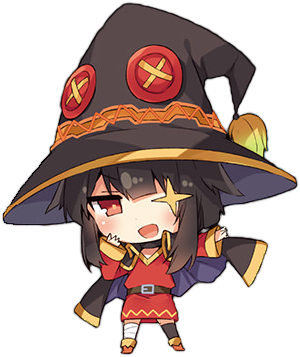 Megumin let out a gentle smile as the Tranquility Girl happily laughed while waving at the sun. As Aqua and I were talking, the potted plant reached out towards Yunyun. As her hand wrapped around Yunyun’s outstretched finger, the seedling broke out into a laugh. Saying that, the three of them left the scene, leaving me and the seedling alone. I moved to pat the head of the doll-sized girl with my finger. Narrowing my eyes, I questioned the seedling. But the seedling simply laughed as if nothing happened. Due to Darkness appearing at the worst possible moment, I couldn’t go through with my plans of taking care of things on the spot. Just then, Megumin and Yunyun came back carrying a plate of crushed vegetable scraps. In response, the three of them gave me a worried look. Their gazes turned sour as I addressed the seedling once more. Aqua gently placed her hand upon my shoulder. As I started lecturing the seedling, I could feel everyone else inching away from me and quietly whispering amongst themselves. Occasionally, I would hear words like hospital and strange behavior and the like. Certainly nothing that would inspire confidence. … Fine, don’t blame me if anything bad happens. Just as I was about to give up, Komekko curiously wandered over. I was a little worried that Komekko would end up giving me the same look that Megumin and the others are, but she simply drew closer to the seedling. … Even in a different world, children are just as cruel as ever. “Her skin is white”, apparently the artist did not get the memo. Anyone have a PDF or epub of this volume please ? I find myself hoping they’ll take the tranquility girl in the same direction as the succubi. Maybe Kazuma could sell that fruit as a diet food, too. Are all Tranqulity girls so sassy? And Komekko is the MVP. Are Tranquility Girls sweet, spicy, tart, sour, savory, or bland. Let us ask Komekko in about 3 minutes. Even human babies should be kept at a distance, just to be sure. Maybe kazuma really has a special ability other than his absurd bad and good-luck like true nature seeker? Fellow evil’s eye? Something that makes weird or lonely girls and monsters feel comfortable showing their true color in front of kazuma? I’m interested to see if the tranquility girl becomes important or if they just leave her.